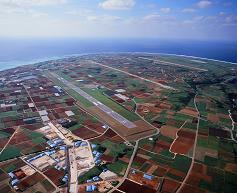 Aguni Island is an environmentally rich island Ie-jima Airport, which has a 1,500m-long runway, was constructed as one of the projects of the Okinawa Ocean Exposition, which was held in July 1975, and began service on the 20th of July 1975. All Nippon Airways and Southwest Airlines operated YS11 aircraft during the Exposition, but they ceased operations when the Exposition came to a close. Southwest Airlines began operating DHC-6 aircraft in place of the YS11 aircraft after the 24th of July 1976. The airport ceased regular operations on February 1977 due to restrictions arising from operating within U.S. Military training airspace and a reduction in number of passengers. Charter operations, however, began in October 1994. Appointed as Third class airport by the Cabinet Ordinance. Appointed as Local airport by the Cabinet Ordinance.